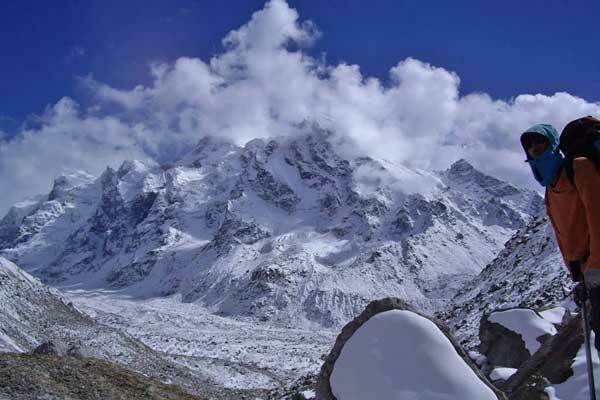 Explore most of the Western Himalayas ecosystems ! 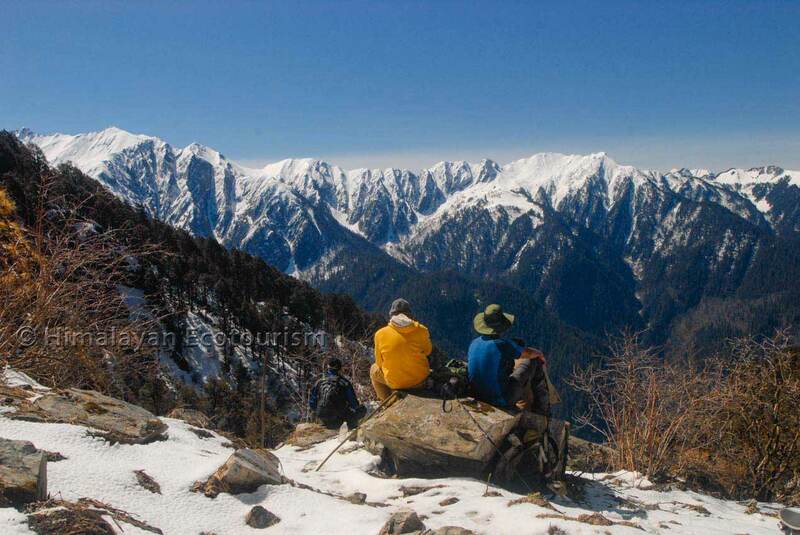 The Dhel trek is one of the most beautiful trek into the GHNP along with Tirth and Raktisar. Dhel is a large meadow located near a pass that connects the Tirthan or the Sainj valley. And so the trek can start from either side. If your purpose is to reach Dhel only, you can start from Niharni in the Sainj valley, reach in 2 or 3 days and come back in 2 days. So the minimumm time for this trek would be 4 days in total. But if reaching Dhel is a great achievement, it would be sad to just reach and then go. Dhel in itself can be considered as your basecamp. And at your basecamp you can either rest and enjoy the wilderness and the landscape, or you could explore the area, reach the nearby mountain edges above 4000 m, observe wildlife, and so on. Dhel is so peaceful that you consider it for yoga. Ask us if you want our instructor to go along with you. 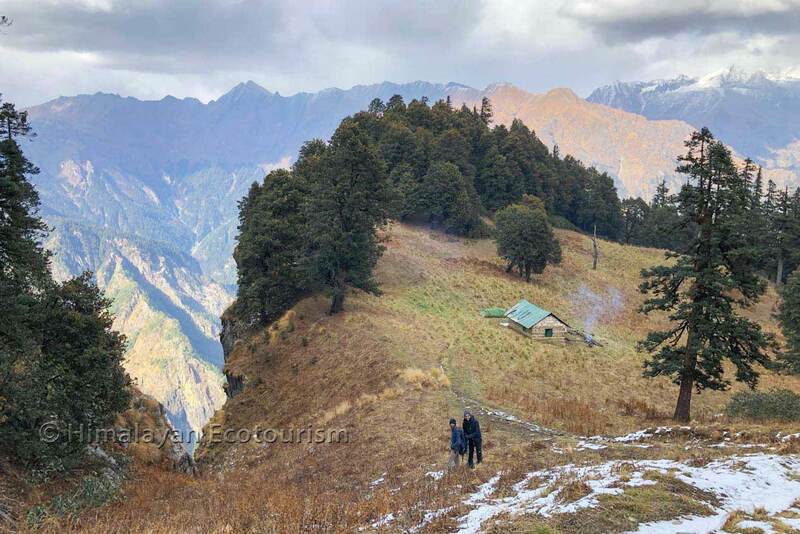 And if you have enough time, the best to do is to reach Dhel, rest for a day and then continue to the Tirthan valley after crossing the pass. There are actually two different passes, the most commonly used is the one that connects Dhel with Gumtrao and then the Shilt hut. 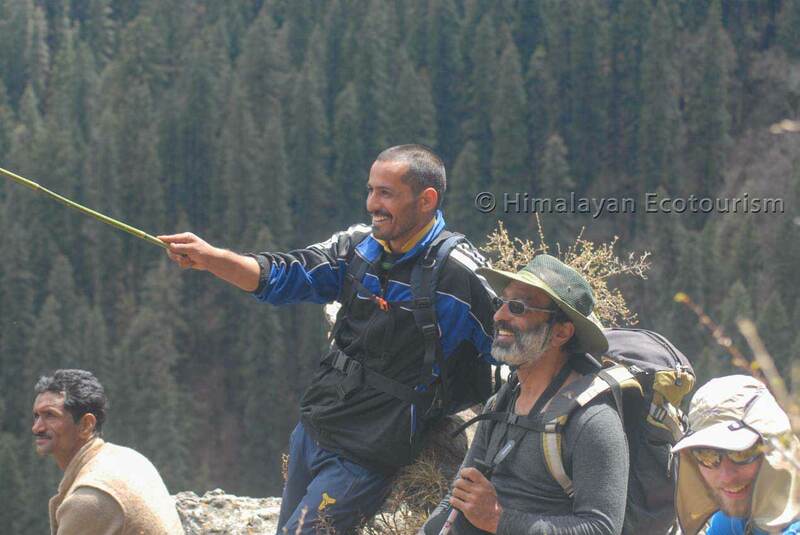 The Dhel trek starts from the road end Niharni. 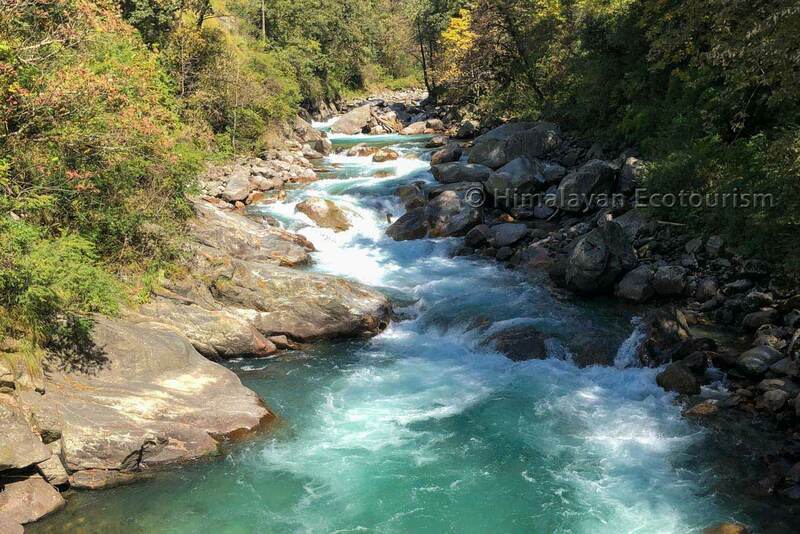 The first day you follow the stunning Sainj river upto the village of Shakti. Then you have a quite steep climb through a dense forest that you can do in two days. 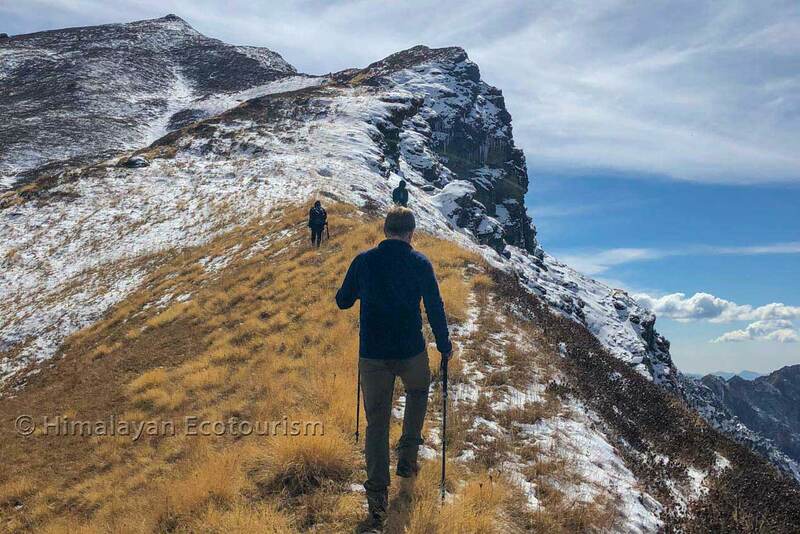 In case you want to cross the pass, the overall difficulty of the trek increases substantially as you have to cross high altitude, steep and rocky terrains. 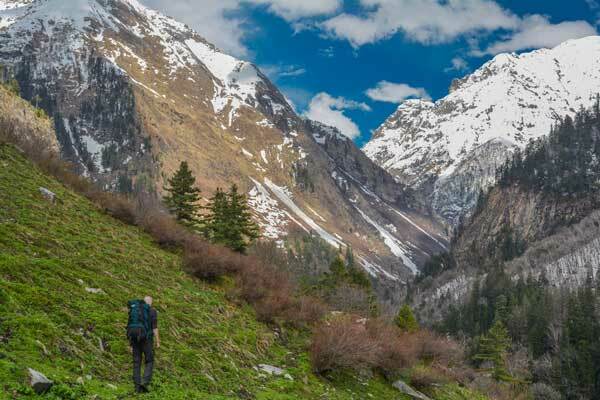 Best time to trek to Pin Parvati is from end of April to June. And then from October to November. The same can be done in 4 days for those who are in a hurry and who are in very good shape to do Shakti to Dhel stretch in one go. Day 1 From Niharni to Shakti. The road creeping in the Sainj valley ends in Niharni. It is a small village that has been mutilated by an hydro-electric project. It is located 1 hour drive from Sainj, and 2 and half hours from Banjar. You escape the starting point by a small path frequented by the local villagers. Shortly after you start you enjoy a peaceful environment in the company of the Sainj river. You follow the river for about 4 to 5 hours. 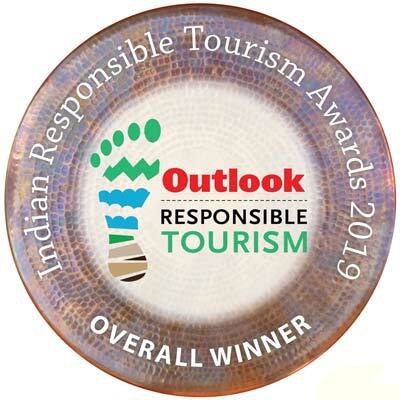 Surely you won't miss the beautiful forest, the amazing colors of the river stream, the waterfalls and the small colorful sacred places where the natural forces of the Himalayas dwell. Stay under tent near the huts made by the Park. Day 2 From Shakti to Bheralnala. Otherwise you start comfortably the ascent towards Dhel considering that you have 2 days to do it. Before Dhel you have two options for a night stay : the first one is Humkani and the second one is Bheralnala. You decide with your guide which one is the best for you according to your fitness and the weather conditions. As you climb the forest become denser and the feeling of being in the realm of the wilderness increases. The view of the surrounding mountains also get gradually better. Have your second camp under the stars ! Day 3 From Bheralnala to Dhel. 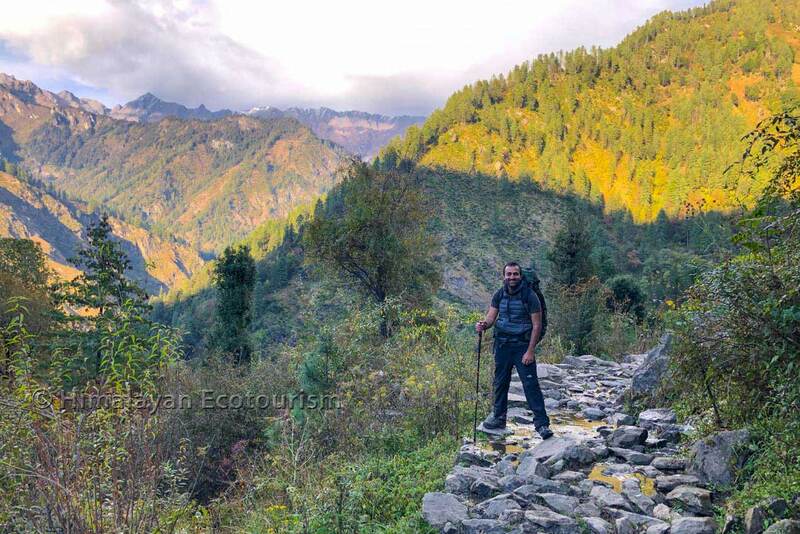 After a good breakfast enjoying the first light on the lower side of the valley, you continue on your way to Dhel. After crossing small streams, going through small landslides, stepping over fallen tree, you finally come out of the forest to step on mountain grasses. You have reached Dhel. Continue up to the small hut where you will have your camp. Day 4 From Dhel to Lapah. The difference of altitude between Dhel and Lapah is quite serious. But it is only a descent ! So you can do it in 3 hours. Enjoy your time at Dhel today morning and leave for Lapah 12ish. Ask your guide to tell you all about the visible peaks in the background, the flora and fauna of the area. You will learn a lot ! At Lapah you can either sleep under tent or ask your guide to arrange the forest restroom. Day 5 From Lapah to Niharni. The descent from Lapah to Niharni has no difficulty. You go down to the Sainj river again where you meet again the path that you have taken the first day. You should reach in two hours. 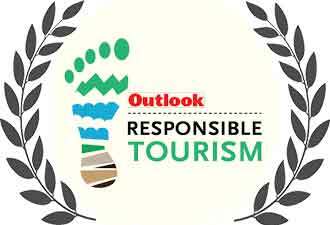 This trek is more challenging compared to the Dhel in 5 days. Fitness and trekking experience required. You start comfortably the ascent towards Dhel considering that you have 2 days to do it. Before Dhel you have two options for a night stay : the first one is Humkani and the second one is Bheralnala. You decide with your guide which one is the best for you according to your fitness and the weather conditions. Day 4 Day rest at Dhel. Today you can enjoy the magnificient place that is Dhel. Ask your guide to tell you all about the visible peaks in the background, the flora and fauna of the area of the GHNP. You will learn a lot ! Or simply spend your day relaxing / meditating. Yoga enthusists remember that we can organize yoga classes at Dhel ! Day 5 From Dhel to Gumtrao. Today is the most exciting day of your trek as you are going to go through the pass. Leave the camp and follow the ridge that is overhanging the meadow. Then you need to turn towards the pass that is well visible now. 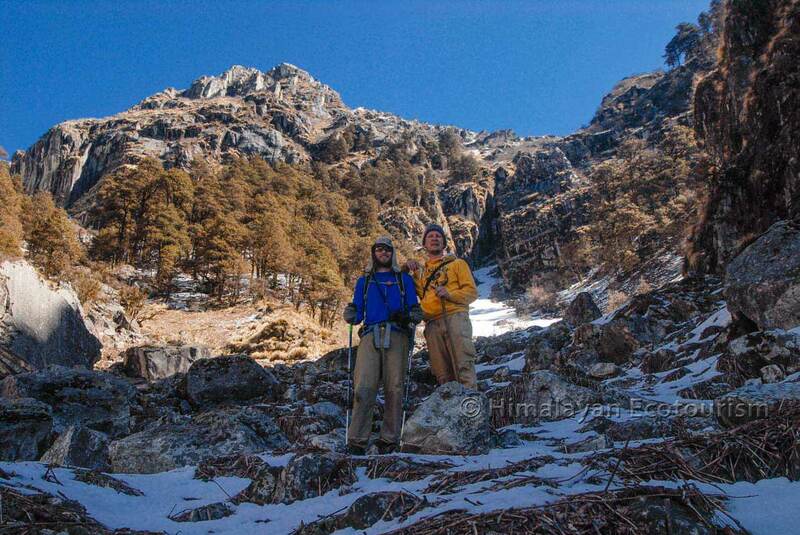 You are at around 4050 m when suddenly discover the other side : the Tirthan valley. After crossing the pass you have a steep descent, be careful, especially in case of bad weather. After around 800 m the slope gets milder and you then have a comfortable walk up to another meadow called Gumtrao. Camping at Gumtrao. Day 6 From Gumtrao to Shilt. Another very nice day. You will be walking on the top of the hill that goes down from the Suka Sar mountain. 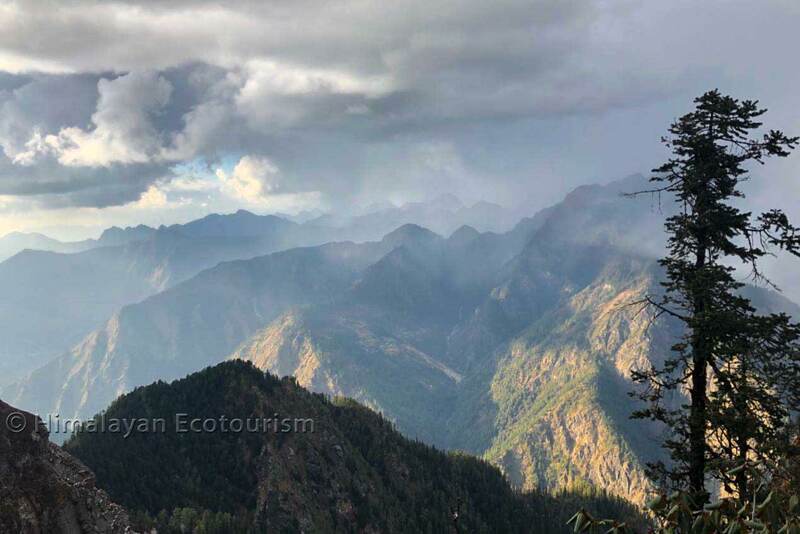 You will have a great view on your left (Tirth side) and on your right (Marahni side) up to Rakhundi top at around 3600 m. Enjoy the peak it has a unique view of the Tirthan valley. 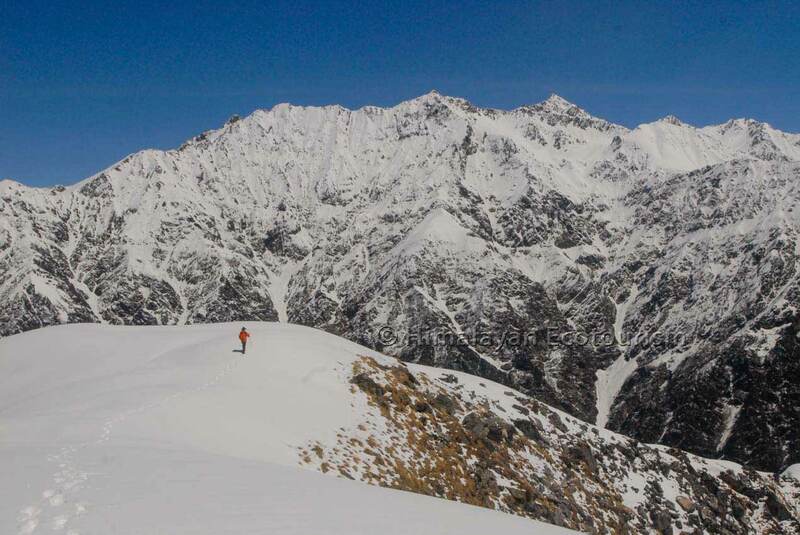 From Rakhundi you have around 2 hours of descent towards Shilt hut. Camp at Shilt. Day 7 From Shilt to Gushhaini. 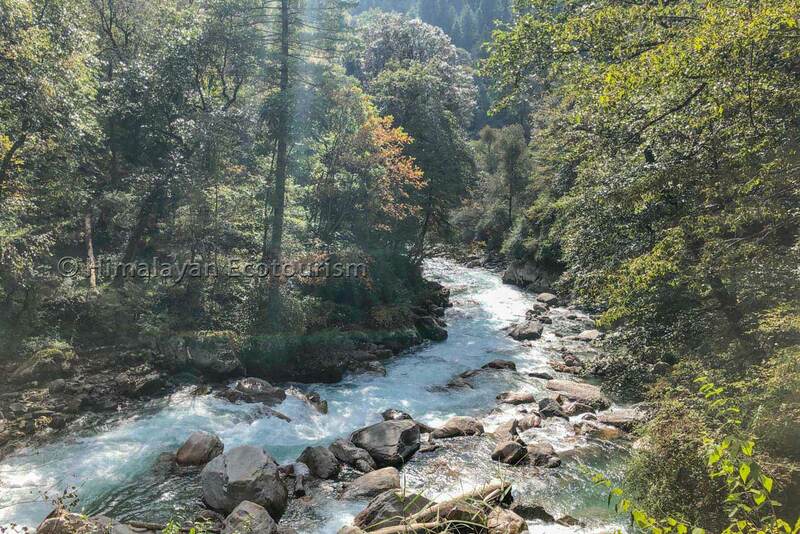 To end your trek you will have the company of the Tirthan river. From Shilt you have a steep and fast descent to Rolla (1 and half hour). Then you are riverside. 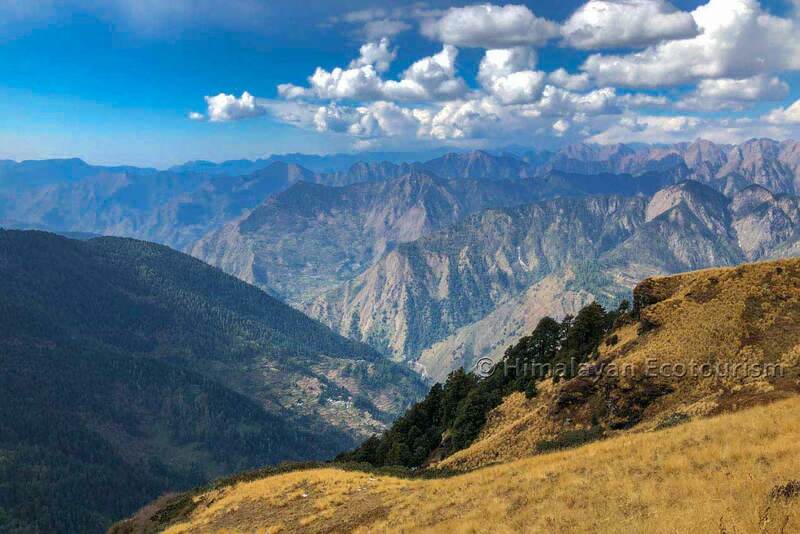 A gentle 3 hour hike will take you to Gushaini. End of your trek. You enjoy the Sainj river on the first day of your trek. The Sainj river will take all your concerns away ! The more you progress the more fascinating the nature is. Say good bye to the hectic world, say hello to the real world ! See how the campsite offers great opportunities for nature lovers. Exploring the area above Dhel to cross the 4000 m threshold. 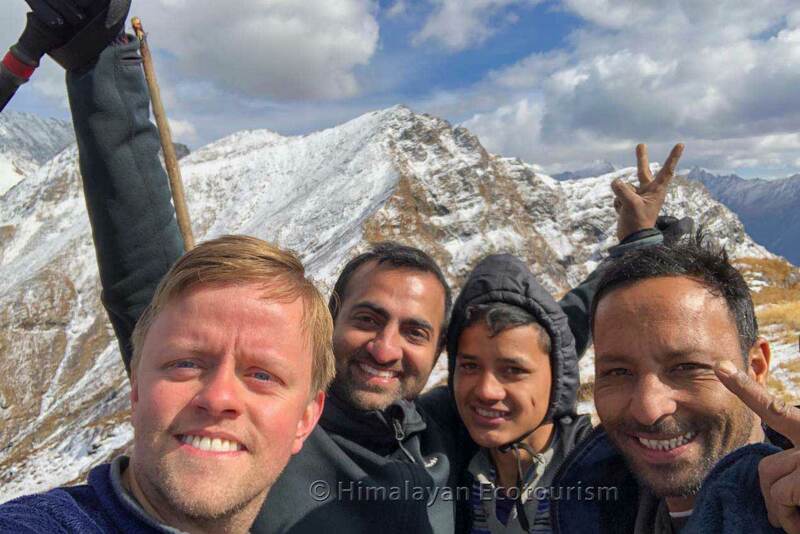 Our friend Phil and Partha with our guide Sanju excited about reaching the pass. Between Grumtrao and Rakhundi early in the season. Be ready with your camera, this area has plenty of wildlife. As you descent you can really enjoy your time ! Your guide will help you observing mammals and birds around.